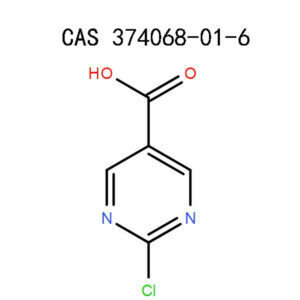 4,6-Dichloropyrimidine-2,5-diamine is a common pyridine compounds, pyridine compounds as the chemical industry, especially the fine chemical material, the application of a wide range of pharmaceutical intermediates, pharmaceutical products, pesticides, pesticide intermediates, feed and feed raw materials and many other fields. 4,6-Dichloropyrimidine-2,5-diamine is a very good pharmaceutical intermediates. Do not touch the skin directly, it will cause skin irritation and corrode the skin. Shopping for chemical products can be a bit hectic, the buying process can even be more tedious if you are not dealing with the right company. At APICMO we not only make your buying process smooth but also guarantee you value for your money. 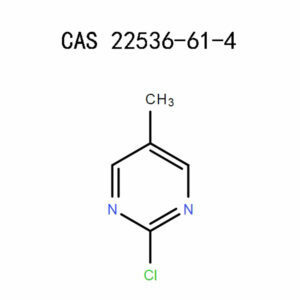 We are a leading chemical products manufacturing company that produces 4,6-Dichloropyrimidine-2,5-diamine (55583-59-0) among other chemical products. All our chemical products conform to the Common Good Manufacturing Practice (CGMP) and other manufacturing regulations. Buy from us today and experience exceptional service. It is a white powder that could also be in chunk form. 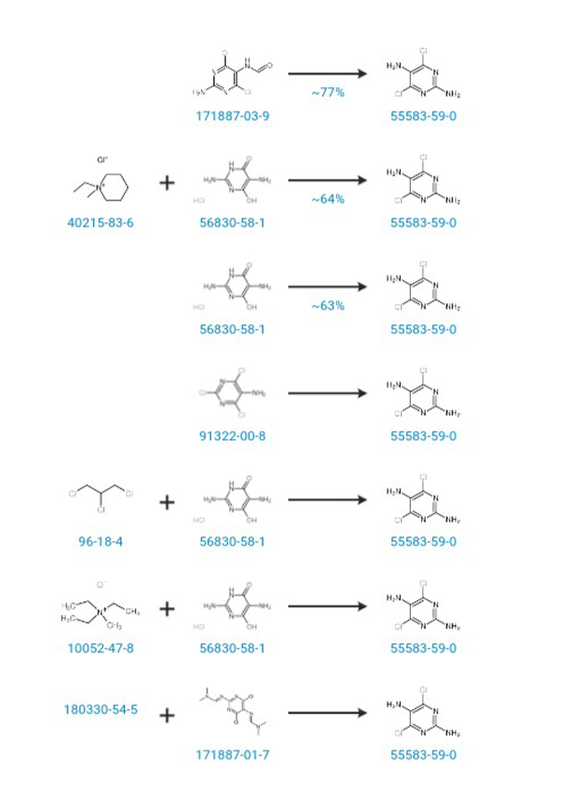 It is a building blockin chemical synthesis. It is an essential pharmaceutical intermediate. 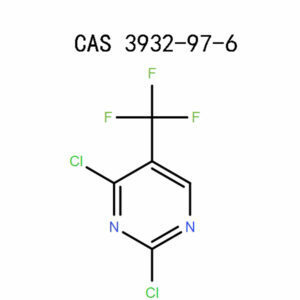 It is an essential reagent in the preparation of hexopyranosenucleosides, Abacavir impurities and carbocyclic. It causes skin irritation once in contact with the skin. Its symptoms could be; skin rash, skin redness, itching /burning, scaling/crusting. It is poisonous once ingested. Its symptoms could be nausea or vomiting, stomach discomfort, fever and loss of appetite. It irritates the respiratory system once inhaled. Its symptoms could be; Difficulty while breathing or shortness of breath, chest tightness and dry/ wet cough. To prevent respiratory irritation, use type P1 (EU EN 143) or type P95 (US) particle respirator. If you need higher level protection from the same, use type ABEK-P2 (EU EN 143) or type OV/AG/P99 (US) respirator cartridges. Wear impervious clothing for protection. You could also wear protective boots if it is necessary. The amount and concentration of the hazardous chemical at your workplace determine the type of protective garment that you wear. Use gloves while handling this chemical. You should always inspect gloves before using them to prevent the substance from permeating to your skin. Use gloves that are of high quality. Use an appropriate glove removal technique to ensure that you do not touch the outer surface to prevent contamination. Always dispose of gloves after using them in accordance with proper hygiene practice and regulations. Wash your hands and dry them when done. Put on safety glasses that have side-shields that comply with EN 166. Ensure that you use tested and approved equipment by proper government standards such as EN 166 (EU) and NIOSH (US). Install a local exhaust or a closed system to protect the workers from being directly exposed to the dust, vapor, fumes produced in the workplace. Install eye baths and safety showers where workers can flush their bodies /eyes and clean their protective garments in case of a spill. Thesafety showers are also crucial for putting out the fire on their clothes in the event of an accident. In case it gets in contact with your skin, take off all contaminated clothing immediately. Gently clean yourself with mild soap and plenty of water. If skin irritation or rashes persist, seek the advice of a doctor. If it splashes to your eyes, rinse cautiously with a lot of water for about 15 minutes. Take off contact lenses if you are wearing any and if it is safe to do so. Continue flushing with water and if irritation persists, see a doctor. Take the victim to a place that has fresh air and make them lie in a rest position that allows them to breathe comfortably. If they are not breathing, give them artificial respiration. Get the attention of a doctor. Rinse your mouth with water. If attending to an unconscious victim, do not give anything through the mouth. Get medical attention. A first aider should always wear personal protective equipment,i.e., rubber gloves and airtight gloves. Ensure that you follow all safety regulations. Wear all the personal protective equipment that is required. Avoid breathing dust, fumes, mist to prevent irritation. Do not consume anything or smoke when using this chemical. Make sure that all containers that you are using are well-labeled. There should be proper ventilation in your working area. Make sure that you are close to safety showers, first aid equipment, spillage equipment and eye baths for fast response to an accident. After you are done using the chemical, dispose of all the containers properly. Clean the work surface to ensure no spills left on it. Remove the protective gear you are in, clean it and give it ample time to ventilate. Clean your hands carefully and dry them. Label all the containers properly for identification and to prevent placing them near incompatible substances. Place the chemical in an area that has sufficient security to restrict access to anyone who is untrained and unauthorized to handle the chemicals as it would lead to accidents. Ensure that you place the chemical in a cool, dry area that has sufficient ventilation. The container should be tightly locked. You should not put the substance near sources of ignition to avoid combustion. While handling this chemical avoid the formation of aerosols and dust as they would be an irritant. Avoid the substance from getting into contact with your eyes or skin. Ensure that there is proper ventilation in the places where dust is formed to prevent its accumulation. Do not allow the substance to get into drains as it is a contaminant. Follow all good hygiene and safety practices including washing your hands before taking a break, visiting the lavatory and at the end of every workday. Ensure that you have first aid equipment close to you for fast response in the event of an accident. Avoid spilling the chemical as it may react with other substances or come into contact with your body. Store the substance in a cool place. Keep the container tightly sealed and placed in a well-ventilated area. Store the chemical under inert gas to prevent absorption of moisture. You could also store it in a desiccator. Store it far from incompatible substances and ignition sources because it is flammable. The chemical may decompose upon combustion to emit toxic fumes. You are therefore advised to wear breathing equipment that is self-contained if necessary. People who are uninvolved should evacuate to a safe place,and in case the fire extends to the surroundings, remove all containers that are movable if it is safe and easy to do so. In case spillage occurs, keep people away from the leak. You should control the entry of uninvolved persons to the leakage area. Pick up the substance carefully without creating any dust. Sweep it up and scoop it, transfer it into an airtight disposal container and close it ready for discarding. Ensure that the substance doesn’t get into drains. It decomposes to produce; Hydrogen chloride gas, nitrogen oxides and carbon dioxide. You may mix the substance with a combustible solvent and burn it in an incinerator that has a scrubber and an afterburner but be very cautious while igniting because this chemical is highly flammable. You can give surplus and non-recyclable solutions to a disposal company that is licensed. Contact a waste disposal company that is authorized to dispose of the waste material for you. You can also recycle to process if it is possible. Dispose of any contaminated packaging as an unused product. Comply with all state, area, federal laws while disposing of this substance. 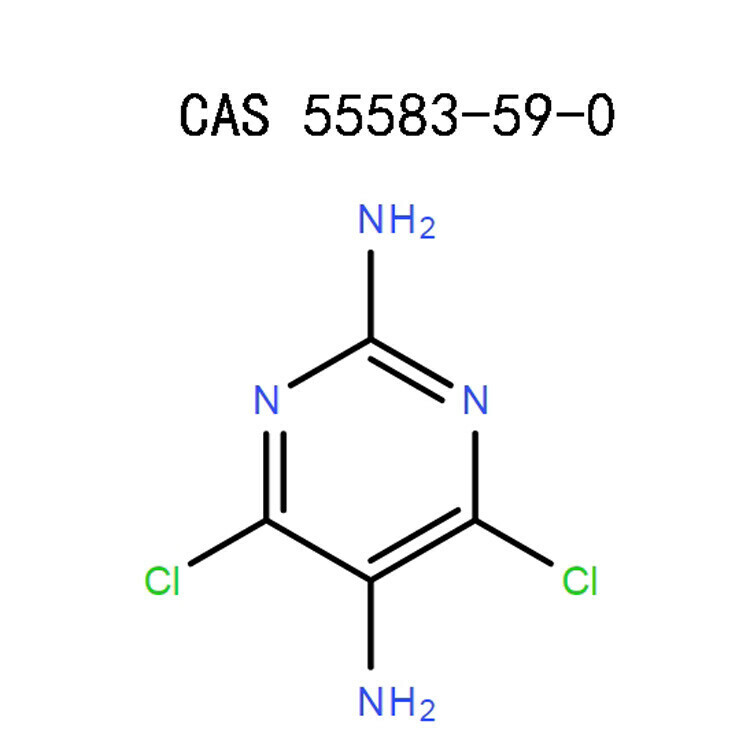 4,6-Dichloropyrimidine-2,5-diamine (55583-59-0) is safe to transport byboth air and by road. 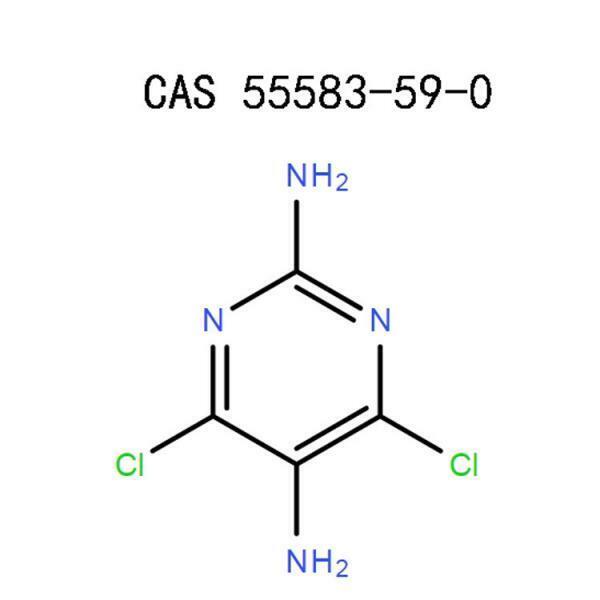 Do you need 4,6-Dichloropyrimidine-2,5-diamine (55583-59-0) for your manufacturing, development or research applications? Contact us now for any inquiries that you may have.